Stuart Besser is playing with time – he has discovered a portal to take him to the 19th Century, and has been going backwards and forwards doing research. But he is discovered by Leopold who follows him back to New York in the 21st Century. When Stuart has an accident and is hospitalised, Leopold has to cope alone in the new world. He meets Kate and her brother Charlie, and starts to fit in. But he must go back to his own time when the portal opens again or history will be irrevocably changed. How can he leave when he has fallen in love with Kate? And will Kate let him go? This is one of those films which is always listed as an archetype of romantic comedies. But time travel is not a huge theme in the rom com world, and this doesn’t rate as a stand out flick for me. I could see no good reason why Leopold would fall in love with Kate so easily, making the whole plot lack substance. Besides which, I found Meg Ryan’s hair just so annoying that it ruined the whole movie! Jackman, however, was fantastic. I just don’t think Ryan could hold up her end of the romance. There was a clear lack of female supporting roles. I suppose this was in order for the spotlight to be on Kate. But I think she needed help, and that was one of the reasons I was disappointed. Posted on 21/06/2010, in the whole rom com list and tagged Breckin Meyer, Hugh Jackman, Liev Schreiber, Meg Ryan. Bookmark the permalink. 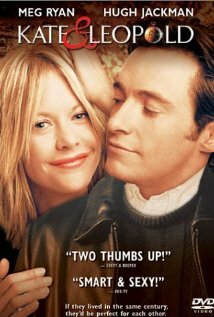 Comments Off on Kate and Leopold.